Magazine exchanges are officially the awesome. Last month, I wrote a post On Not Hoarding Crafting Magazines. I vowed not to let my home turn into a warren of knitting publications. I committed myself to a regular routine of magazine purging, tossing out or giving away the flotsam. Then my blog-pal Carina of Hakelmonster blog proposed a crafting magazine swap. Now, I know what you’re going to say: this doesn’t really promote the cause of reducing the volume of magazines I have in my home. Hoarding fail. You’re right, you’re right, I know you’re right. But our swap wasn’t really about jettisoning unwanted reading materials. It was about sharing and cultural exchange. I sent Carina a pile of Knitscene, Interweave Knits, and Piecework that are less common where she lives. In exchange, she sent me a stack of German language publications we almost never see on my side of the pond. In addition, we each sent each other a couple of hanks of local-ish yarn. Bonus!! I’m excited to start flipping through these magazines. I can already tell that the fashion aesthetic is a little different from what I’m used to, although part of that could be that some of these magazines are a few years old. Do I read German? No. But I’ll have fun asking my husband to help me puzzle through them with his high school German. And if I get really desperate, I’ll ask my mother-in-law for help (she used to teach German in the public schools). Can’t wait to see what you sent to NJ for me!! There is nothing left for me to add other than: can’t wait to see what she sent! Oh, no, no! I keep my publications and return to them when they are vintage! That’s what I recently did with my collection of crochet dolls. They are adorable and it only took me 27 years to get around to making them!!! That was my original intent. But my magazines would take over my house if I did that. So I think I have to just keep my favorites. This craft magazine swap thing is an awesome idea! I tried to find a web clip of the when Harry met Sally quote but failed. Sigh. What a fun idea! 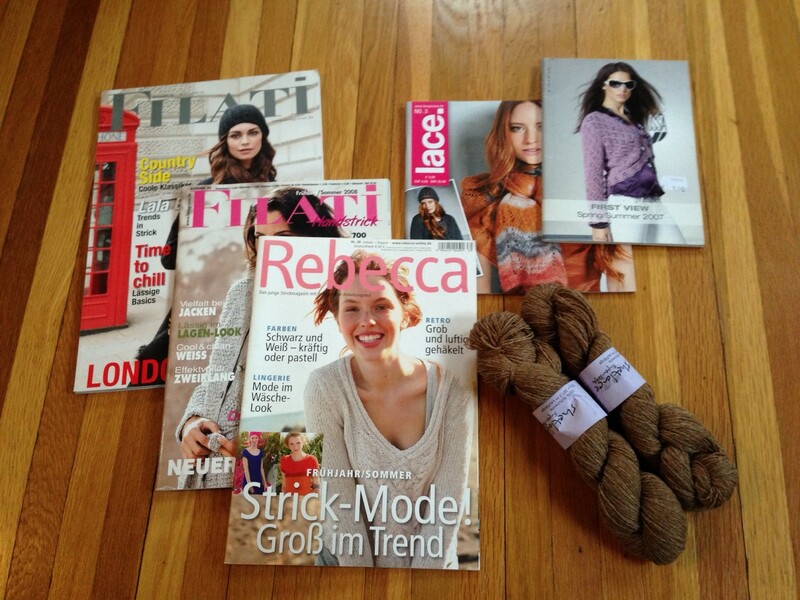 I don’t really tend to have magazines laying around, but I love the idea of trading local knitting/fibery stuff with someone from a different culture.